New Crop Acreage to Exceed Expectations? NASS’s Prospective Planting release is just week away, and AgResource suspects acreage seeded to all major crops will exceed expectations. This is partially due to expected returns and partially due to more land available for spring row crops, and of course US producers rarely leave land left idle. 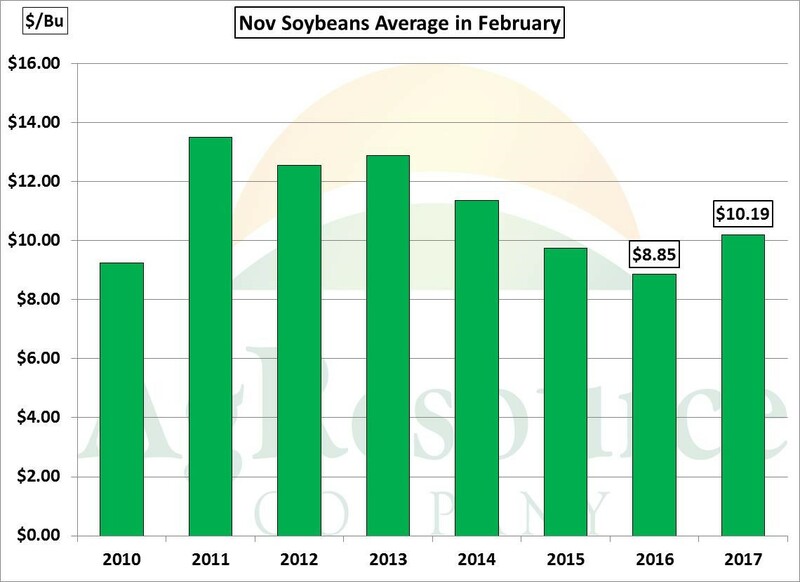 The average prices of soybeans calculated for revenue insurance in 2017 was pegged at $10.19/bushel, vs. $8.85 in 2016 and is the highest since 2015. This is not surprising following last year’s crop shortfall in South America, and also amid record US consumption. 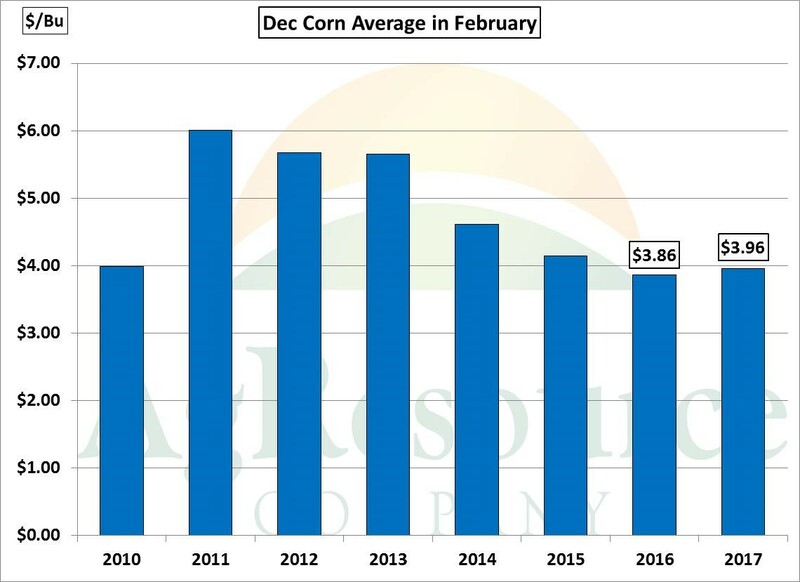 But even in corn, the average price of Dec futures in the month of February was calculated at $3.96/bushel, vs. $3.86 a year ago, and despite higher projected US end stocks and record global corn inventories. 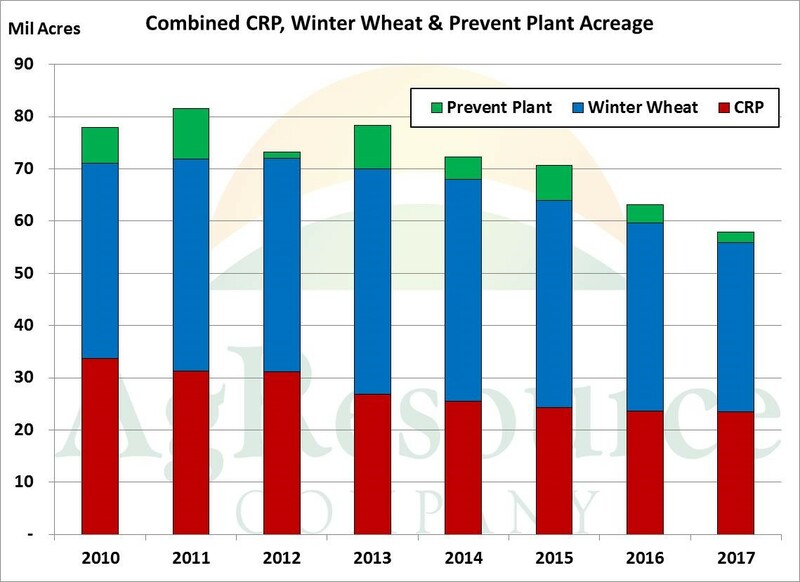 Overall, the markets in recent weeks seemed to have sent a signal to maintain or expand total cropped acreage, which amid lofty supplies, and a very likely loss of world market share (via South American crop) may have been the wrong signal. However, the heart of the issue is the lack of alternative land uses. The CRP program has been capped at 24 million acres moving forward. Winter wheat seedings this year at 32.4 million will be the second lowest on record, and assuming normal prevent plant acres of 1.5-2.0 million, there’s a full 5.3 million acres available for corn, soybeans, cotton, sorghum and spring wheat that wasn’t available last year. Without threateningly wet or cold weather in April, total US cropped acres (corn, soy, wheat and cotton) are likely to be unchanged on last year, which compares to a USDA report in February suggesting total cropped acres would be down 2.2 million acres. Our office was full on March 8th with people listening to Ben's market webinar. Ben discussed the market outlook for the next few months as well as the long term (five year) outlook. We are planning the next webinar for late June.